The BBC recently reported that the Stockholm International Peace Research Institute has calculated that US military budget is now 58% of the total for the whole world. It has grown enormously even during the recession. And now stands at $607bn, or about $2000 per US citizen per year. That's 4% of the GDP. After the US the second highest expenditure is now China, which spends about $85bn per year, which due to their huge population is only $63 per person per year, and third and fourth place are taken by France and the UK, each spending about $65bn, or about $1000 per person per year. The Netherlands, meanwhile, now spends about $10bn per year, or about $683 per person per year. That's about 1.5% of the GDP. And what does this have to do with cycling ? Well, Assen spends about 27 Euros per person per year on cycling infrastructure. That's about $37 per person per year, and a fairly typical level in the Netherlands. A small sum compared with the military figures we're looking at. In the past, people from both the US and the UK have told me that providing decent cycling infrastructure as the Dutch do is too expensive for their countries. 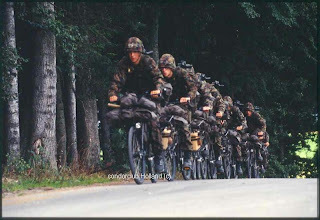 However, to take the USA as an example, if the military budget was cut by a mere 2%, still leaving them easily outspending the whole of the rest of planet on weaponry, they could also outspend the Dutch on cycling provision. The UK would have to cut its military budget by more like 4% to achieve the same thing, still leaving that country as one of the biggest military spenders. It really depends where your priorities lie. Bombs vs. bikes. The "axis of evil" countries are also interesting. Take Iran, for instance. They spend about $6.7 bn per year on arms. That's about 3% of the country's GDP. Their population is 70 M. so that works out as about $96 per person per year. i.e. roughly 1% of the overall figure and under 5% per person compared with what the USA spends. You can find these figures for virtually any country directly on the SIPRI website. 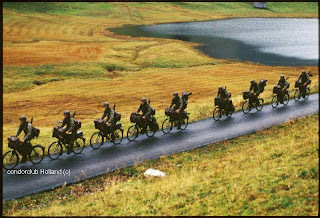 The photos of Swiss soldiers on "Swiss Army Bikes" come from the website of the Condor Club in the Netherlands, enthusiasts of the machines who have have a great list of military bicycles from around the world. Switzerland spends just 0.8% of its GDP on the military. I wonder how much of our (U.S.) military spending goes towards allowing other friendly countries to spend less. Not that I think it's justifiable always, nor that I think we're getting our money's worth, but it would be nice to think that there is at least a small silver lining, that somehow we're keeping the world at peace. I really don't know. I have one of those slow smoldering rages about the $500 billion we spent in Iraq. What has it given us? Safety? One less dictator? Cheap oil? From my perspective, it's hard to tell. Spending that money on bike lanes and paths would have been nice, and a decent train and subway system might even have been more useful than anything else. These improvements could have gone very far towards reducing our demand for oil, which was at least one of the reasons for invading in the first place. "I wonder how much of our (US)military spending goes towards allowing other friendly countries to spend less." US military spending causes a lot of countries, like Canada, to spend more. For example, the only reason why Canada maintains a nuclear weapons capability is to deter US military aggression. I think, in true fearmongering fashion, the US shows that it is indeed afraid of everything by keeping such a military budget. The problem is we do so much to infuriate the rest of the world, it's no wonder we're so afraid of them. In any case, China owns so much of our debt, they could just cash it in and own us at pretty much any given point. No military needed. So far, we haven't really done anything to make ourselves less dependent on oil, and apparently we use more oil than India and China combined. That's going to hit real hard when we actually get to oil scarcity. Somehow I think we would be much better served as a country by spending on transportation infrastructure to reduce the everyday person's need for a car (among other things like re-zoning cities for higher density), and less on making the rest of the world angry at us and promoting fear and hate.